What exactly is an “umbrella” policy? 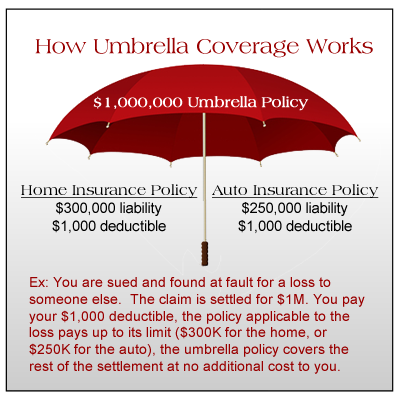 It is additional coverage over an above the limits of your home and auto insurance policies. For example: You are involved in an accident with a high powered executive who was driving her Mercedes home one night. Her injuries are severe and she is unable to work for 6 months as she recovers. Your auto policy limits were $250,000 per person with a maximum of $500,000 per accident, but the cost of her injuries and lost wages total $1,000,000. Then what? She sues you, and not only do you end up losing your savings account, but your future earnings are also affected. Financially, you are ruined. An umbrella policy would have protected you. There are several limits available to choose from and the coverage is inexpensive. Most $1,000,000 policies are $200 or less per year and extend the coverage on any specified underlying policies including home, auto, motorcycle, boat, and even some landlord properties. There is an additional benefit as well. Most policies will also provide protection for things excluded on the underlying policies, including false arrest, libel and slander.